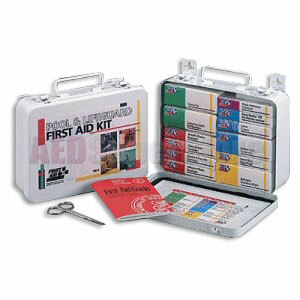 This 99-piece, 16-unit pool and lifeguard first aid kit has everything you'll need around the pool. Use the products in this kit for insect bites, minor cuts, and eye irritations. In addition, our lifeguard kits provide a CPR one-way valve face shield to protect you from contaminants when performing CPR. Products are contained in a strong metal case with gasket.